John Robbie spoke about this photo this morning, of a refugee father, Laith Majid and his children, after arriving in Greece, where they are seeking relief from their war-torn town of Deir Ezzor in Syria. Relief agency, MSF tweeted: "So far in 2015, 92,475 Syrians have arrived in the #EU. 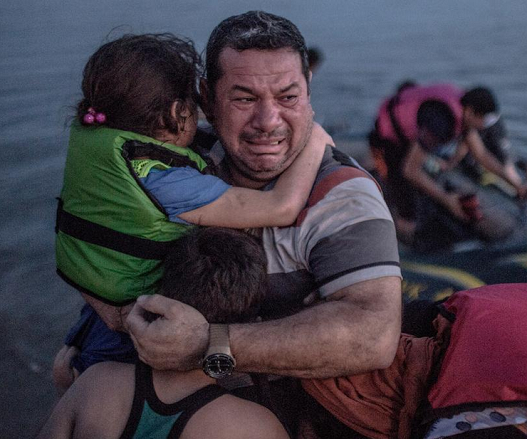 More than 4,000,000 are hosted by #Lebanon, #Turkey & #Jordan"
The photo, by Spanish Photographer, Daniel Etter shows the father, with tears of relief streaming down his face, while holding his son and daughter after arriving on the island of Kos in Greece on 15 August. It has received numerous amounts of shares around the world, with many people urging the world to see the issue of migrants and immigration differently. According to a European website, Majid and his family had travelled on a flimsy inflatable boat carrying 15 men, women and children. The response to this image are still incredible. If you consider helping. @MSF is doing great work. Not only in Greece.